Audeo PFE 112 Perfect Fit Headphones Giveaway! Enter now through March 9th, 2010 to win a pair of Audeo PFE 112 Perfect Fit headphones from Phonak ($139 MSRP)! Maximum of one entry per person. The giveaway will end at 11:59pm on March 9, 2010. I’m an e-mail subscriber and would love to win! I’d love to win these headphones. I’m an email subscriber, and would love to win a pair of high quality earbuds. I’m a subscriber and would love to enter this contest…..
We always need more headphones! Boy do I need replacements for mine! Thanks for the opportunity! I am an email subscriber and I would love to win these headphones. I subscribe via email. For years still haven’t found a pair of headphones that suits my taste, would love to get a chance at these. Would be a cool contest to win. Never have enough headphones. I’m currently an e-mail subscriber to your Techlicious Newsletter, and would love to win the Audeo Perfect Fit Headphones Giveaway! I’m an email subscriber and I’d love to win these headphones! i could use some new headphones. Great! Real headphones. I’ll take a pair. I’m a subscriber. I love these. 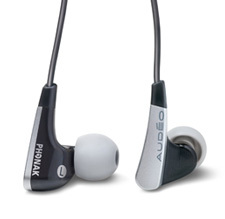 Mine have gone missing and I’d love to own a pair of Audeo PFE 112 Perfect Fit headphones. Thanks. I could really use such cool headphones please!! I am sooooooooo interested in this giveaway! i have’nt ever been able to find headphones that fit my ears except big bulky ones that cover my whole ear..i want these!!!!!!!!!!!!!!! I’m already a subscriber and these would be great headphones to use at work. I have the bose earphones that are similar. But these seem to have better sound. I am a subscriber and i would love to win. I subscribe and I would love to win these. I have tiny ear canals and think these may fit! Yes, I’d like to have these! I’m always a big fan of in-ear headphones. I’d love to win these. Thanks! I would love to win these headphones! I would love to win these - Thanks! I subscribe! This would be a cool prize to win. i could use one of these!! I’m a email Subscriber and I would love to be enter into this giveaway. Thanks! I subscribed and would like to enter. Email subscriber. Think if I wore these to bed at night they would drown out the snoring? Subscriber (found out about this from opening the latest missive); I’d enjoy giving these a listen! I’m a software developer and work in a noisy environment. These would help me block out distractions and listen to music while I work. Would love to win and could really use them too! I want to win, these are great. I love to win headphones, money, concert tix anything!